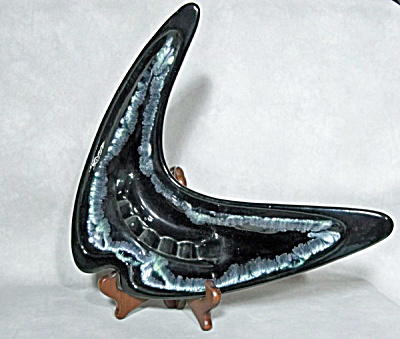 This Royal Haeger #107 Ebony Cascade 1954 ashtray has 5 rests and is fully signed on the bottom. Great chevron shape, talk about biomorphic or boomerang. This is it!. Part of the 'new' Cascade glazes Haeger debuted as part of their 1954 line. Excellent condition. Would look stunning on a blond wood coffee table.